Now here’s a fish that will make you say ‘wahoo!” A 202-pound wahoo was caught off the coast of Palm Beach, Florida, marking a potential world record. But unfortunately it won’t count in the record books because the crew took turns on the rod. 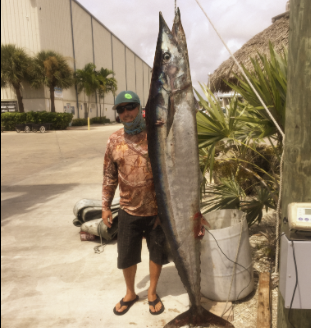 The previous record for wahoo was set at 184 pounds by the International Game Fish Association. Captain Bill Romeros wrote about experience aboard his 55-foot Viking sport fishing boat for Lake Worth Fishing Charters, calling it the highlight of his fishing career, he wrote. He said they were in search of a goliath grouper with a small bonita they were trolling at around 195 feet when suddenly they were hooked. “Right away we knew it wasn’t a goliath because it screamed to the surface 100 yards from the boat and started streaking along the surface with its tail out of the water,” Romeros wrote. Thinking they had hooked as sailfish, the customers were excited as they took turns fighting the fish for the next 40 minutes before it finally came into sight. “When we saw the stripes we knew it was a giant wahoo! With only one gaff on board, it took 3 of us to hoist it over the gunnel and into the boat,” Romeros wrote. Although it won’t qualify for an official record, it was still one heck of a big wahoo and the fish of a lifetime for everybody on board. previous articleDid This Goat Help Lift Curse on Chicago Cubs?